Christian Family Care purchased a free-standing, 28,000 SF office building to renovate in the Central Avenue corridor. It includes a new main entrance and waiting area, private meeting areas for the counselors, open and private offices, and a new employee lounge to serve as the central hub of the organization. PHOENIX, ARIZ. (April 17, 2019) – McCarthy Nordburg, a woman-owned boutique architectural interior design firm, recently has showcased its expertise and design acumen for a diverse set of clients across the Valley. 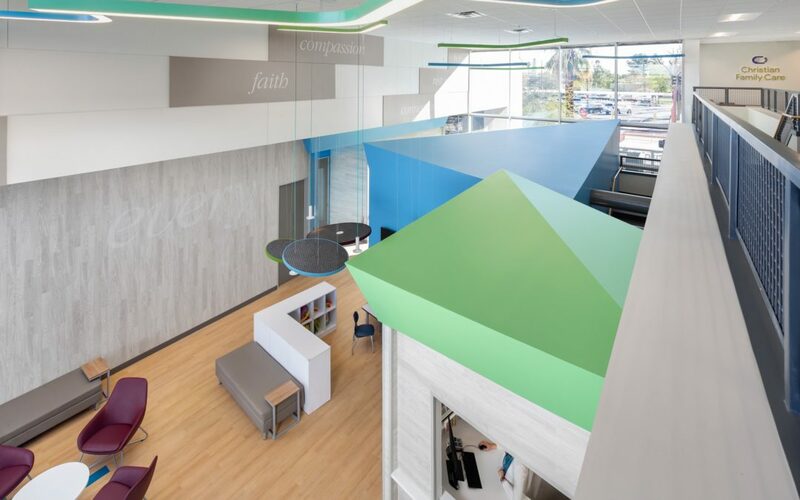 Design work by the locally-owned, award-winning firm includes projects at Arizona’s Children Association and Christian Family Care in Phoenix; ARM, Workuity and Zovio (previously Bridgepoint Education) in Chandler; and Cincinnati Financial at Rivulon in Gilbert. Arizona’s Children Association was completed the end of 2018 at 3636 N. Central Ave. Founded in 1912, ACA is one of the largest statewide child welfare and behavioral health nonprofit agencies in Arizona. It provides a variety of services to meet the needs of more than 40,000 children and families each year. It leased 39,000 SF of the entire second and third floors and part of the eighth floor. All were renovated to meet the current needs of ACA. The contractor was able to complete the renovation during normal business hours with little to no disruption to the building, which had an exposed, open two-story lobby atrium. The design includes new flooring and millwork throughout, a reception area, day care area, private and open offices, a breakroom, a galley, a training room, and conference and IT rooms. The brightly colored design is functional and reflects the brand and culture of Arizona’s Children Association, on a judicious budget. GC was Wespac Construction; Project Manager was CRESA. Arizona’s Children Association leased 39,000 SF of the entire second and third floors and part of the eighth floor. All were renovated to meet the current needs of ACA. 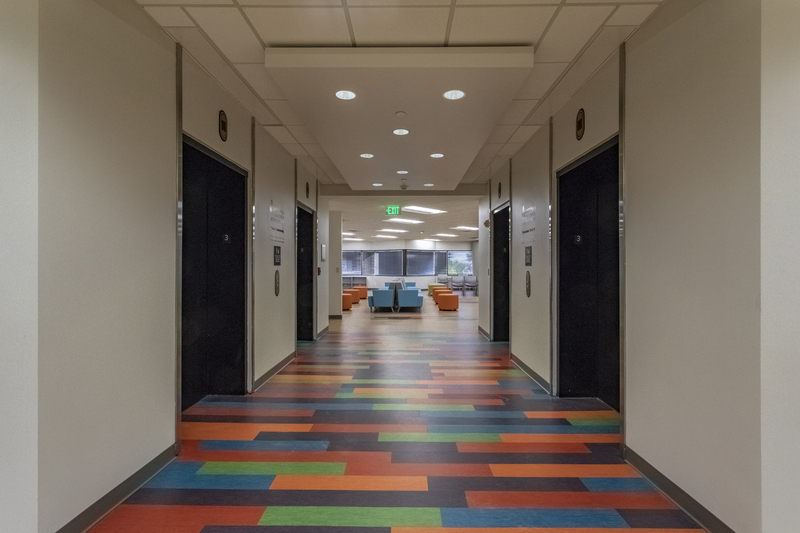 The contractor was able to complete the renovation during normal business hours with little to no disruption to the building, which had an exposed, open two-story lobby atrium. ARM offers complete and secure connectivity, device and data management solutions for their partners and customers. It chose McCarthy Nordburg to design its new offices in The Park at San Tan, 3075 E. Ray Road, in Chandler. ARM relocated and redesigned the 19,700 SF offices to accommodate its business. ARM’s new offices comprise an open environment. The client allowed the design team the freedom to push the boundaries and create a design that speaks to its culture and brand. The new offices comprise an open environment. The client allowed the design team the freedom to push the boundaries and create a design that speaks to its culture and brand. The new design includes bold colors, an open office environment and unique interior architectural elements. 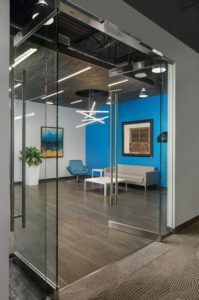 Features included LED acoustical and decorative pendant lights, a decorative wood slat feature in the entry and interior plant wall elements that also helped with acoustics. GC was Brycon Construction; Project Manager was CRESA. Christian Family Care is one of the state’s largest private nonprofit social services agency that provides adoption, foster care and child and family counseling programs. It focuses on meeting the needs of children and families in Arizona. Founded in 1982, CFC was in need of a new facility to meets it current needs. CFC purchased a free-standing, 28,000 SF office building to renovate in the Central Avenue corridor. It includes a new main entrance and waiting area, private meeting areas for the counselors, open and private offices, and a new employee lounge to serve as the central hub of the organization. GC was RSG Builders. Workuity added to its footprint in the Valley as its newest location opened at the Class A office building, Chandler Viridian. The 19,000 SF co-working space is set to build on Workuity’s growth with numerous amenities and fresh common areas. 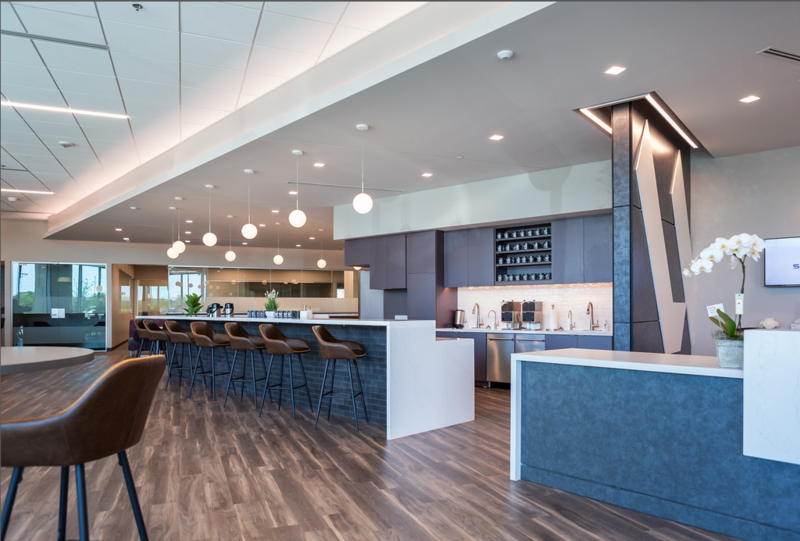 Workuity offers the biggest variety of dynamic work spaces complete with sleek, dedicated private and open offices with floor-to-ceiling glass, ample free meeting rooms, a luxurious open employee lounge and various conference room settings. McCarthy Nordburg created a design that speaks to its culture and brand. GC was VENN Construction; Broker and Project Manager was JLL. Workuity’s 19,000 SF co-working space is set to build on its growth with numerous amenities and fresh common areas. This Cincinnati-based insurance company has joined the high-profile lineup of companies in the Rivulon 161 Building in Gilbert. It leased approximately 15,000 SF on the second floor of the premier Class A office building with plans to move into its new offices later this spring. The offices are traditional and speak to the established business and brand of Cincinnati Financial. The contractor currently under construction is Stevens Leinweber; Project Manager is Colliers International. Zovio is an online college dedicated to harnessing creativity and technology to enrich the lives of students. Its new 130,000 SF call center in Chandler is intended to reflect the same forward-thinking and people-focused values that make it the leader in the online education industry. With a clean, resimercial (residential and commercial) aesthetic woven with subtle elements of biophilic design, Zovio’s new call center looks less like a corporate office and more like an exciting place to work, socialize and live. The first floor totals 80,000 SF and the mezzanine totals 50,000 SF. This center houses an exterior patio, stadium seating for town halls, a health clinic, fitness center, and full-service café. Technology meets creativity with DIRTT modular walls, acoustic panels and white noise systems that strategically eliminate sound overlap. The contractor currently under construction is Stevens Leinweber. “The volume of space for Zovio’s new call center played a critical role in the study of scale and proportion. Each space was studied in three dimensions to fully understand the dimensional impacts of ceiling and architectural elements as they coexisted within the space,” Hobart said. Zovio’s new call center looks less like a corporate office and more like an exciting place to work, socialize and live. The first floor totals 80,000 SF and the mezzanine totals 50,000 SF. Founded in 1986, McCarthy Nordburg is a local boutique architectural interior design firm guided by the same founding principles – design, inspiration, measurable results and extraordinary service. Our mission is to create smart workplace and design solutions for professional corporate offices, financial services, higher education and tenant improvement services for landlords. We are known in the marketplace as leading innovators – not followers. Collaborating with our clients and consultants is an essential part of our process. Understanding objectives is the basis for developing uniquely timeless solutions that go beyond achieving client goals to inspiring levels of workplace enjoyment and productivity beyond their expectations. McCarthy Nordburg has earned both local and global prestige for more than three decades. We are consistently voted in the Top of AZ ranking and recognized for award-winning design from AZRE, Contract Design, Corporate Interiors, IIDA and NAIOP. For more information visit mccarthynordburg.com.